Working for a company that loves its customers as much as its subject matter is quite rewarding. Every year at BEA (BookExpo America, in NYC), Storey Publishing does something fun to engage our loyal customers and ensure that the following year they will make a point of stopping back at the Storey booth. 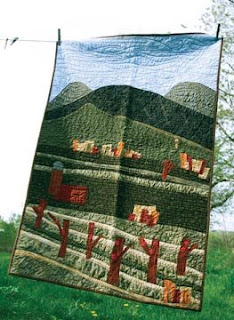 This weekend at BEA, in honor of our newly released book, The Quilting Answer Book, we will raffle off a gorgeous handmade quilt, a wall hanging that represents many of the ideals of country living that Storey encourages our readers to pursue. Part of my job in the marketing department is to come up with ideas, design marketing pieces, and source the materials. Sometimes a project requires that I perform one or more of these tasks — in this case it was all three. The idea was developed during a marketing brainstorming meeting. 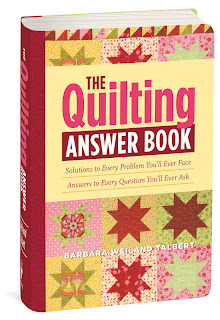 The marketing team already knew that we were going to give away The Quilting Answer Book in the "Answer Book Bag" (another creative marketing idea to promote all of Storey's Answer Book Series), and we thought it would really push this title to hang a handmade quilt for all to see and for one lucky winner to take home. By the time the raffle idea was born, many of Storey's employees had attended the first-ever Twist Craft Fair held in Northampton, Massachusetts. Storey's creative director, Alethea Morrison, and editorial director, Deborah Balmuth, met Rebecca Fricke of Bedscape Designs and saw her quilted masterpieces at Twist. Her unique and beautiful quilting style really made an impression on our two supercrafty directors! The quilt raffle idea brought back to their minds Rebecca Fricke's quilts, and both Alethea and Deborah recommended that I try to contract her for the job. Rebecca was interested and available to take on the job. She remembered Deborah and Alethea and was thrilled to work on a project for Storey Publishing. Once Rebecca was on board, I needed to provide her with a theme/idea/imagery to work from. 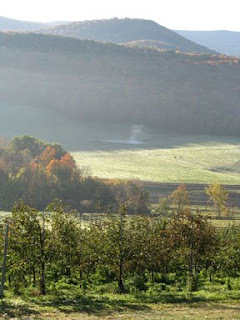 The following weekend the foliage in the Berkshire mountains was almost at its peek, pumpkins and apples were ready for harvest, and it was a great time of year to shoot awesome scenic photographs of the country life that Storey represents. 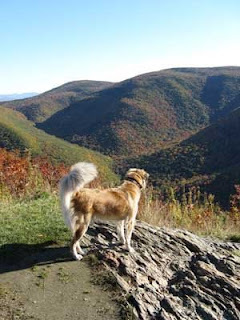 I took my trusty hiking companion, my dog Lily, and set out on a fall adventure, camera in hand. I took many photographs that day. The ones that suited my quilt idea best came from the roadside opposite Mt. 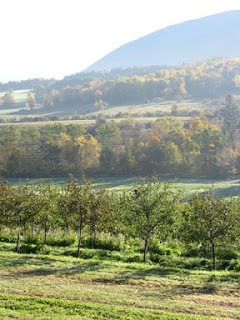 Greylock High School in Williamstown, Massachusetts, overlooking an apple orchard, a cow pasture, farmland, farm structures, and Mt. 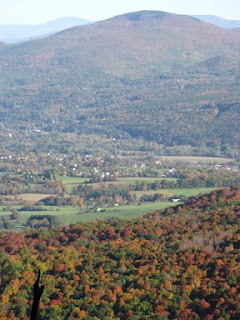 Greylock (the mountain). I couldn't quite get everything I wanted into one shot, so I made a rough collage using Adobe Photoshop to get my idea across to our quilt artist. 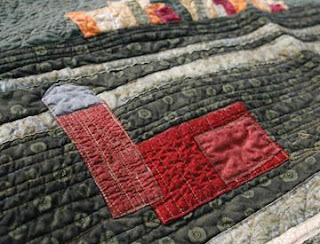 I wrote to Rebecca and asked that the quilt highlight all the important aspects I had collaged into my Photoshop scene. I provided her with the original photos plus my ideal scene. Listed below are the four originals; the captions relate what I thinks works best with each. The collage that follows takes each of these ideals and pulls them into one image. 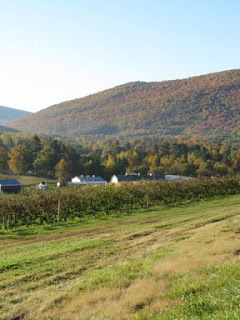 farm buildings (which are not clear enough), apple orchard, and farming fields. The angle is not great, and more emphasis needs to be put on the aforementioned elements. This photo really singles out the trees in the orchard. with mountains in the background. but the sky could be a little bluer. Collage photo of ideal quilt layout and the final quilt. One of our slogans is "Storey Books for Country Living." 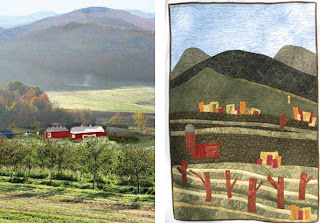 The quilt pictures a small-town farm that visually describes what our books teach: self-reliance, living off your land, and personal independence with the environment. The collaboration of the marketing team and our artist, Rebecca Fricke, produced a work of art that sends Storey's message. All of us in the office were reluctant to go through with the raffle — we were so impressed with the outcome that we wanted to keep it here for us to enjoy! However, we are just as pleased to give something so treasured to those who support Storey. Kristy, this is a wonderful post! I'm sure that many people (especially me) didn't realize the amount of planning and thought involved before the quilt was even sewed. Thanks for showing your process. I love hearing about process! Mostly people get to enjoy the end result of art or design and all the hard work, problem-solving, and intelligence behind it is largely invisible.